Background: The Cardiac Purkinje System (CPS), mainly locating on the endo-cardial surface, is very important to physio-pathology of the ventricle, diseases on which are the most in the whole heart. The location and the width of branches are essential to the paths of the electrical signal activation on CPS. However, current ventricle models are presented inclined to ignore its real geometry or use some simple geometry to approximate its real geometry. Objective: In view of such problems, a methodology in this paper is presented for semi-automatic construction of a computational geometry model of cardiac purkinje system, based on canine anatomic data. 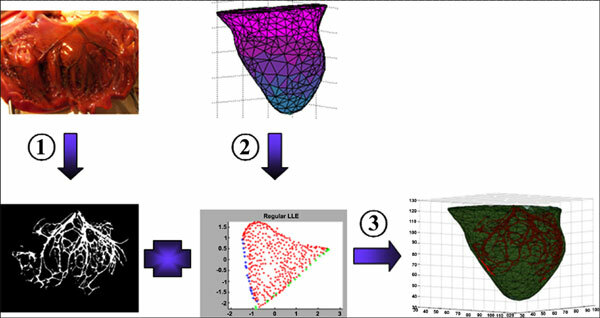 Method: The methodology includes linear extraction by fast marching method, mapping and inverse mapping from 3D surface model of the endocardial layer to 2D image. And the methodology is implemented in a semi-automated way, with the virtue of faster and more accurate. Results: Compared to existing construction methods, the result obtained by anatomical data is real and effective, more accurate and less time occupation. Conclusion: This paper presents a construction model of CPS, using anatomic specimen data, so it is very close to the reality of the CPS. Keywords: Construction, cardiac, purkinje system, anatomic data, computational model, geometry. Keywords:Construction, cardiac, purkinje system, anatomic data, computational model, geometry. Abstract:Background: The Cardiac Purkinje System (CPS), mainly locating on the endo-cardial surface, is very important to physio-pathology of the ventricle, diseases on which are the most in the whole heart. The location and the width of branches are essential to the paths of the electrical signal activation on CPS. However, current ventricle models are presented inclined to ignore its real geometry or use some simple geometry to approximate its real geometry.